Some have called Buxton a Black Utopia. In the town of five thousand residents, established in 1900, African Americans and Caucasians lived, worked and attended school together. It was a thriving, one-of-a-kind coal mining town created by the Consolidation Coal Company. This inclusive approach provided opportunity for its residents. Dr. E.A. Carter was the first African American to get a medical degree from the University of Iowa in 1907. He returned to Buxton and was hired by the coal company, where he treated both black and white patients. Attorney George Woodson ran for file clerk in the Iowa Senate for the Republican Party in 1898, losing to a white man by one vote. Author Rachelle Chase details the amazing events that created this unique community and what made it disappear. Rachelle Chase is a senior business analyst for Fortune 500 companies and a published romance author with an interest in African American history. She currently lives in Iowa. 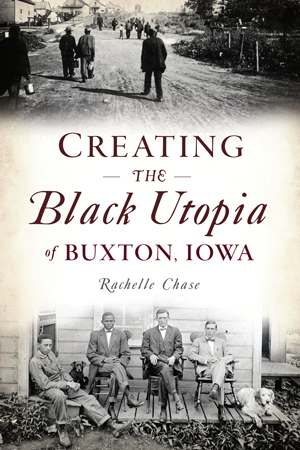 Eight years ago, after stumbling upon Buxton, Iowa, while visiting a friend, she began researching it, promising herself she’d write a book about it one day. When she moved to Iowa four years ago, she finally did. Rachelle hopes that this book will raise awareness about the historical significance of Buxton—a town way ahead of its time—and help preserve what little is left of Buxton.